In the past I’ve made lemon meringue pies with the usual filling of egg yolks, water, lemon juice, lemon zest, cornstarch, sugar and butter; but this week I’ve been trying a new method — replacing water with milk. Last week I made a lemon pie with condensed milk. It was delicious and sweet, but reminded me of a Key lime pie disguised as lemon meringue. This one was more to my liking. 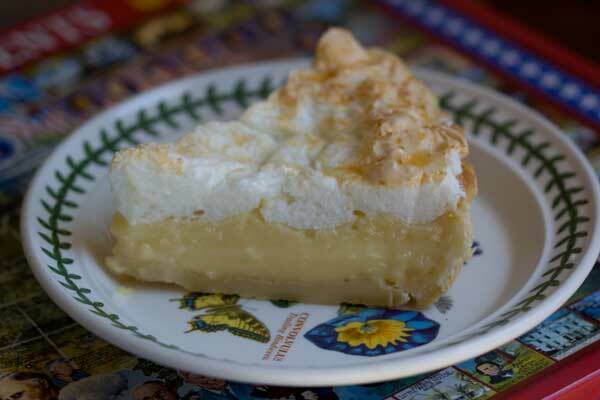 This lemon meringue pie made with milk is less sweet, very tart and has a smooth and creamy texture. As for the crust, I re-tested a cream cheese based recipe and confirmed that cream cheese crusts were not my favorite for blind baking. So far, Grandma Ruth’s is still in the lead. For the meringue, I used my latest favorite which I find convenient and easy to remember. However, if you are on a mission to find the perfect no-weep meringue, check out this page where I posted a lot of different meringues back-to-back. The one I like best is Shirley Corriher’s recipe (pictured on that page), but it calls for marshmallow creme and I hardly ever have that around. Line up all the ingredients and have everything ready to go. Prepare the meringue as directed at the bottom or wait and prepare it after you make the filling. I prefer to make the meringue first so that it's ready to go and I can quickly slather it on top of a piping hot filling. Mix the sugar, cornstarch and salt in a large (3 ½ quart) non-aluminum saucepan. Whisk the egg yolks, milk and lemon juice together in a bowl. Whisk the milk mixture into the saucepan with the sugar mixture and turn heat to medium. Whisk constantly until mixture begins to boil -- this could take anywhere from five to 10 minutes. When mixture begins to thicken and boil, boil for 1 minute, whisking constantly. Remove from heat and whisk in the lemon zest, butter and vanilla. Pour into the pie shell and immediately spoon meringue around the edges to seal. Spoon remaining meringue over the center and cover all of the lemon filling. Bake at 325 F for about 25 minutes. Let cool at room temperature, then transfer to the refrigerator and chill for several hours. Meringue: Beat the egg whites until foamy, then add the cream of tartar. Continue beating until soft peaks form, then beat in the sugar a few tablespoons at a time along with the cornstarch. I first spotted this milk based filling in a Southern Living book, but the recipe included a different crust and meringue. I used my own 9 inch deep dish baked crust and my favorite meringue (as of late) which is the one with 4 eggs etc. I increase everything by half and make an extra fat pie. Everything fits fine in my Pyrex deep dish glass pan. Tastes delicious made with milk! I have to say, I find the appearance of Grandma Ruth’s flaky crust (from earlier this week) more appealing. I’m definitely going to try it during the holiday baking season (hopefully, I’ll have lost these pesky extra pounds by then!). This is a must try when I get home.